In large, dense cities, where public transit provides a robust network of lines and services, bikesharing may offer quicker, cheaper, and more direct connections for short distances normally traveled by walking or public transit. Though bikesharing competes with traditional public transit services, it also eases transit congestion during peak hours. In suburbs and small- to medium-sized cities, where public transit can be sparse, bikesharing complements transit and provides better access to and from existing lines. In these places, bikesharing serves as an important first- and last-mile connector and increases public transit use. Despite notable differences in how bikesharing programs affect different cities, they consistently enhance urban mobility and reduce automobile use. To better understand these enhancements, we delve further into the demographics of bikeshare members and provide a detailed analysis of how bikesharing affects other types of travel. 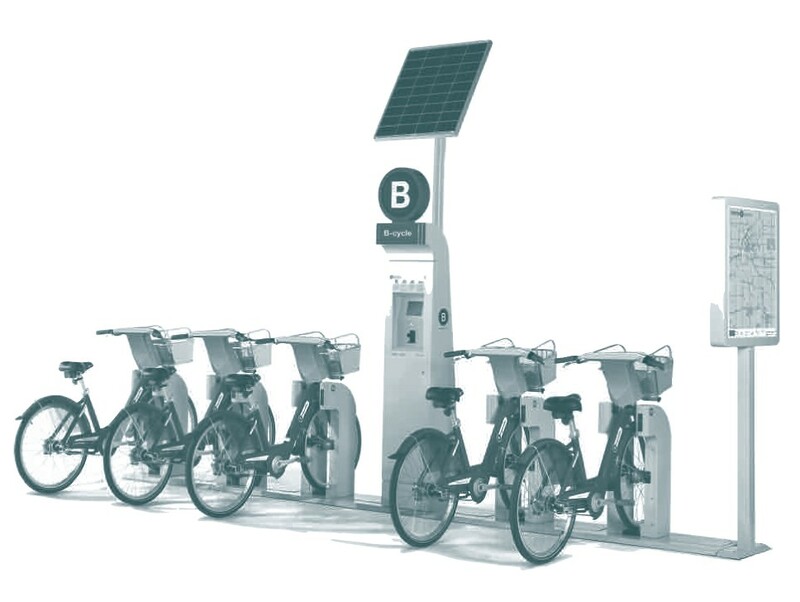 Bikeshare systems allow users to access bicycles on an as-needed basis from a network of stations typically concentrated in urban areas. Bikesharing stations are usually unattended and accessible at all hours, providing an on-demand mobility option. Most bikeshare operators are responsible for bicycle maintenance, storage, and parking costs. Bikesharing patrons join the system for an annual fee or rent a bike on a trip-by-trip basis. At the conclusion of their rental, riders return the bike to any docking station, which allows for both one-way and roundtrip travel. One-way travel has, in particular, unlocked new travel options that result in modal shifts among bikeshare users. For example, a person might bikeshare in the morning to get to work and then take the bus home. Although before-and-after studies documenting public bikesharing benefits are limited, several programs have conducted member surveys and collected bicycle data to record program effects. Early program data suggest that bikesharing can result in emission reductions and modal shifts. For example, in Boston, Hubway data showed a carbon offset of 285 tons after two years of bikesharing operation. Bikesharing has the potential to bridge gaps in existing transportation networks as well as encourage people to use multiple transportation modes. Beginning in November 2011, we administered an online survey to members of bikesharing programs in Montreal, Toronto, Washington, DC, and Minneapolis-Saint Paul. About 15 percent of members responded to our survey, for a total of 10,661 responses (6,486 in the US and 4,175 in Canada). 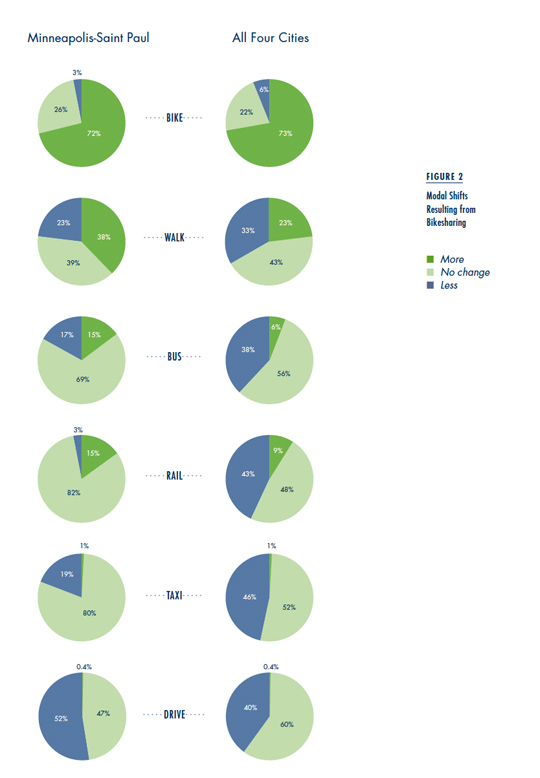 The survey asked how respondents shifted modes as a result of bikesharing. Table 1 summarizes the results. We also collected respondent demographics, including home and work locations. We geocoded intersection data to calculate the distance between home and work locations in Minneapolis-Saint Paul and Washington, DC. We used this information together with survey responses to evaluate whether commute distance was associated with a shift to or from alternative forms of transportation. Our study indicated both a modal shift toward bicycle use and a heightened public awareness of bikesharing as a practical transportation mode, corroborating findings from previous bikesharing evaluations. 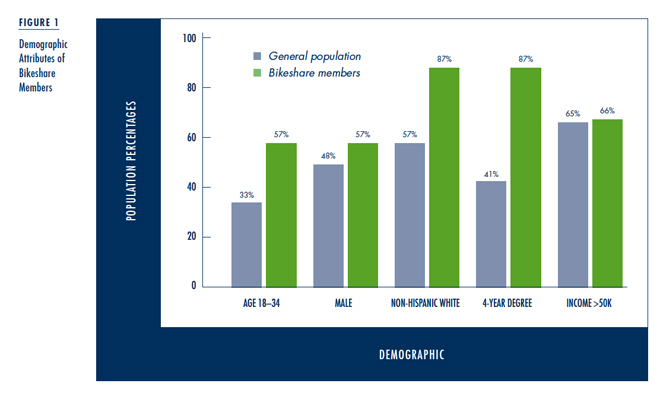 Within the four cities, bikeshare members were younger, disproportionately male, more likely to be non-Hispanic white, and significantly more educated than the general population (Figure 1). This may reflect the initial placement of bikesharing stations within downtown cores with high levels of white-collar employment. It may also reflect characteristics of early adopters, such as access to credit/debit cards, which are typically required for system use. The survey responses suggest that bikesharing, especially its ease of one-way travel, results in different travel behavior than traditional cycling. Bikeshare members in Montreal, Toronto, and Washington, DC shifted away from cars, buses, and rail. In Minneapolis-Saint Paul, bikesharers shifted away from buses but toward rail: five times more bikesharers increased their rail travel than decreased it. And in contrast to members in the other cities, more bikesharers in Minneapolis-Saint Paul increased their number of walking trips (38 percent) than decreased them (23 percent). 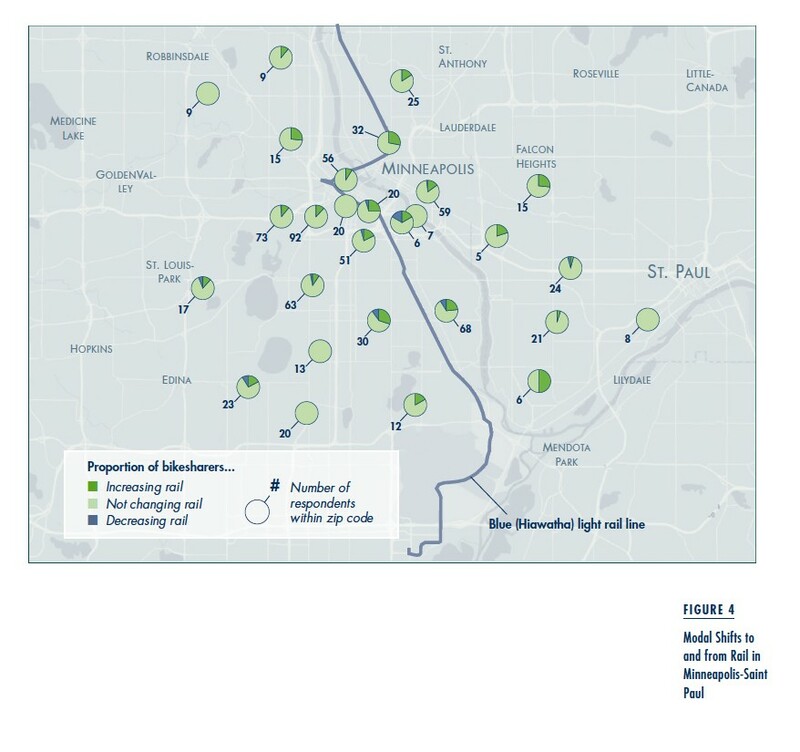 Figure 2 shows the responses from Minneapolis-Saint Paul and the combined responses across all surveyed cities, which more reflect the mode shifts in the larger bikeshare systems. The differences in modal shift between Minneapolis-Saint Paul and the other three cities may stem from factors such as city size, population density, and the extent of the public transit system. Perhaps the greatest distinction with respect to rail shifts is related to the relatively small size of the Minneapolis-Saint Paul rail transit system. Although Minneapolis-Saint Paul opened a new light rail line in June 2014, the Blue Line was the only light rail transit in the region at the time of our survey. In contrast, rail systems in Montreal, Toronto, and Washington, DC are more extensive. We employed a geospatial analysis to more deeply assess the differences in modal shift between Washington, DC and Minneapolis-Saint Paul. We developed comparative maps of modal shift in both cities for rail and bus aggregated and grouped by zip code. Figures 3 and 4 illustrate the geographic distribution of modal shifts to and from rail among bikesharers in Washington, DC and Minneapolis-Saint Paul. The maps present pie charts for each zip code with segments to illustrate increased, constant, or decreased rail use. 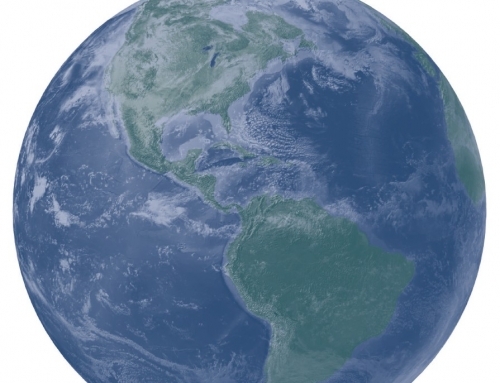 The number overlaid in each pie chart is the number of respondents in that zip code. DC bikesharers are concentrated downtown, where bikeshare stations are abundant and the rail network is most congested. Shifts away from rail were highest around this area, suggesting that bikesharing may substitute for shorter trips previously taken on rail. Reduced demand for rail transit among bikesharers, particularly in the city center, may benefit public transit operators during rush hours in large transit-intensive cities like Washington, DC. By adding transportation alternatives, bikesharing opens up additional capacity on congested bus and rail lines in the urban core. Indeed, one reason Capital Bikeshare was launched in Washington, DC was to relieve congestion on the subway system. Additionally, bikeshare systems in cities with developed rail systems can save people time by providing more direct routes between their destinations, as well as providing health benefits and cost savings. By adding transportation alternatives, bikesharing opens up additional capacity on congested bus and rail lines in the urban core. In contrast to DC, the Minneapolis-Saint Paul bikesharers demonstrate a uniquely positive net shift toward rail. Figure 4 shows that the shift toward rail occurs both in the downtown core and in the suburbs. The simplest explanation may be the layout and extent of the rail network at the time of the survey. Minneapolis had a single, linear rail line compared to DC Metro’s multiple, interconnecting lines. In this linear system, bicycles did not offer any time savings over short rail trips that require transfers because transfers between rail lines did not exist at the time of the survey. Bikesharing’s primary effect in Minneapolis-Saint Paul was to increase access to and from the lone rail line. The increased rail usage indicates that bikesharing provides an important first- and last-mile connection for users with origins or destinations beyond walking distance from rail stations. Consequently, in smaller, less transit-rich cities, bikeshare can provide a low-cost alternative to public transit expansion. Bus ridership in Washington, DC shifted in the same way as rail ridership shown in Figure 3. Few respondents in the urban core of DC indicated increasing their bus use as a result of bikesharing. The respondents who did report increased bus use were primarily near the edges of the region. In Minneapolis-Saint Paul, respondents were almost equally likely to increase their bus use (15 percent) as decrease it (17 percent). 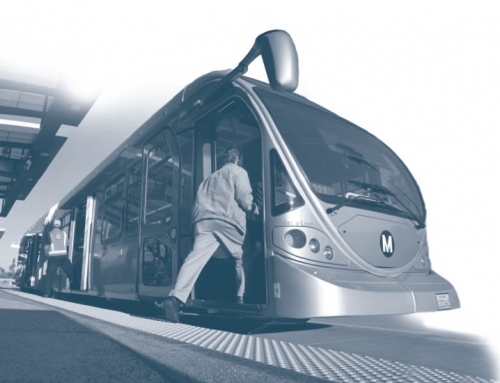 Like rail, the shift toward bus was distributed within the urban core as well as the suburban periphery. In contrast to DC, this may suggest that bikesharing in the downtowns of cities like Minneapolis-Saint Paul serves a more balanced role in both complementing and substituting for bus travel. The results for walking are somewhat different. More bikesharers increased rather than decreased their walking in Minneapolis-Saint Paul, whereas the opposite occurred in DC. But in both cities, the shares of those who increased and decreased walking are more balanced relative to shifts in other modes. That is, 17 percent of DC bikesharing members walked more while 31 percent walked less. For Minneapolis-Saint Paul, 38 percent walked more and 23 percent walked less. The broader conclusion from this is that bikesharing often complements walking in certain cities but is likely to be situation-specific. Some members in the suburbs may bikeshare instead of walking to/from public transit. Downtown users may walk more to the actual bikesharing stations but then use public transit less. 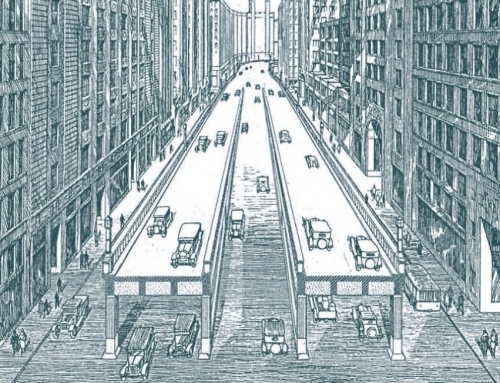 These and other modal shifts invite further study across a wider variety of urban and suburban environments. Bikesharing has grown rapidly in North America and has provided an innovative mobility option that can both substitute for and complement public transportation. In areas with more robust or congested transit networks, bikesharing may offer quicker, cheaper, and more direct travel over short distances that have traditionally been taken on foot or public transit. In areas with smaller public transit systems, bikesharing serves a greater role as a first- and last-mile connector. These promising findings show that bikesharing has notable potential to enhance urban mobility and reduce automobile use in a wide variety of North American cities. 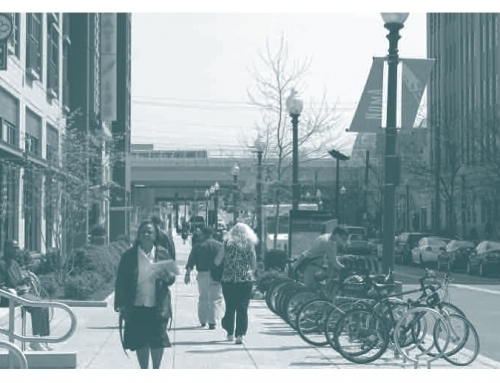 This article is adapted from “Evaluating Public Transit Modal Shift Dynamics in Response to Bikesharing: A Tale of Two U.S. Cities,” originally published in the Journal of Transport Geography. 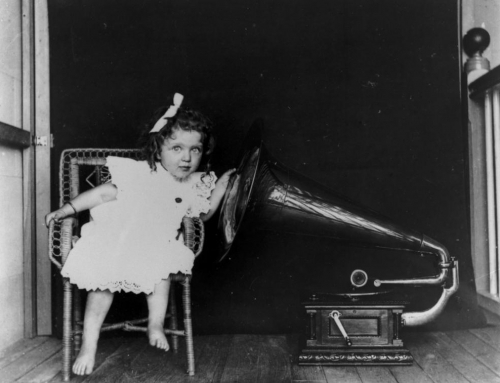 Elliot Martin and Susan Shaheen. 2014. “Evaluating Public Transit Modal Shift Dynamics in Response to Bikesharing: A Tale of Two Cities,” Journal of Transportation Geography, 41: 315–324. Nice Ride Minnesota. 2010. Nice Ride Subscriber Survey Summary Report. Susan Shaheen, Stacey Guzman, and Hua Zhang. 2010. “Bikesharing in Europe, the Americas, and Asia: Past, Present, and Future,” Transportation Research Record, 2143: 159–167. Susan Shaheen, Elliot Martin, Nelson Chan, Adam Cohen, and Mike Pogodzinski. 2014. 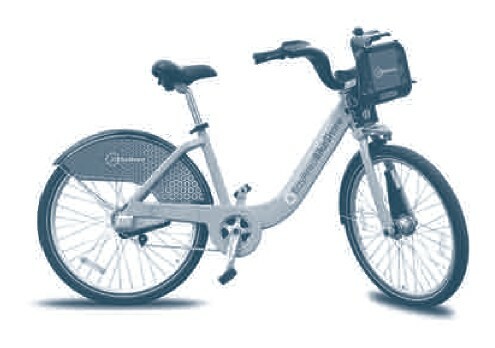 “Public Bikesharing in North America during a Period of Rapid Expansion: Understanding Business Models, Industry Trends, and User Impacts,” Mineta Transportation Institute Report 12-29. Susan Shaheen, Elliot Martin, and Adam Cohen. 2013. “Public Bikesharing and Modal Shift Behavior: A Comparative Study of Early Bikesharing Systems in North America,” International Journal of Transportation, 1(1): 35–53. Elliot Martin is Assistant Research Engineer at the Transportation Sustainability Research Center (TSRC) at the University of California, Berkeley (elliot@berkeley.edu).